Just in the nick of time, I have managed to both bake and decorate a Halloween pumpkin layer cake to take along to a friend’s Halloween/Trick or Treat party. The four layer sponge is sandwiched with vanilla buttercream and home made bramble jam before being iced and decorated with spiders in a giant spiderweb. The pumpkin sponge is largely based upon a carrot cake recipe and the joy of using pumpkin is that the sponge stays fresh for several days. You could use freshly cooked or tinned pumpkin puree for this recipe as both work equally well. I can vouch for this having tested out both. Whisk until the icing is smooth and creamy. Add a little more milk if the icing is very thick. This will make it easier to spread. Add plastic spiders, as many as you have! This cake will keep well, if covered, for up to a week. You could also replace the pumpkin with butternut squash. Beautiful cake Laura! 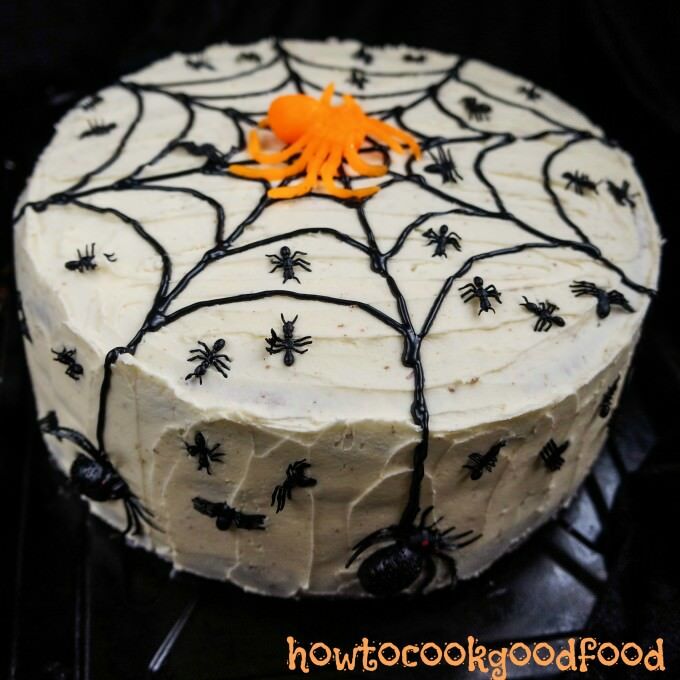 I love how you decorated it with a spider web and spiders! Thank you for linking to my wicked witch finger cookies recipe. Happy Halloween! 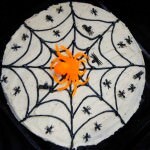 Thanks Diana, I am getting more into my cake and biscuit decorating now, especially for Halloween and Xmas! Hi Helen, I would recommend trying the pumpkin puree although i haven’t been able to find any apart from in Waitrose which makes it harder to source. I love this cake! Such a creative and creepy addition to any Halloween party. I’ve never had bramble jam before. Sounds like a great addition though. Hi Andrea I am pleased you like it. 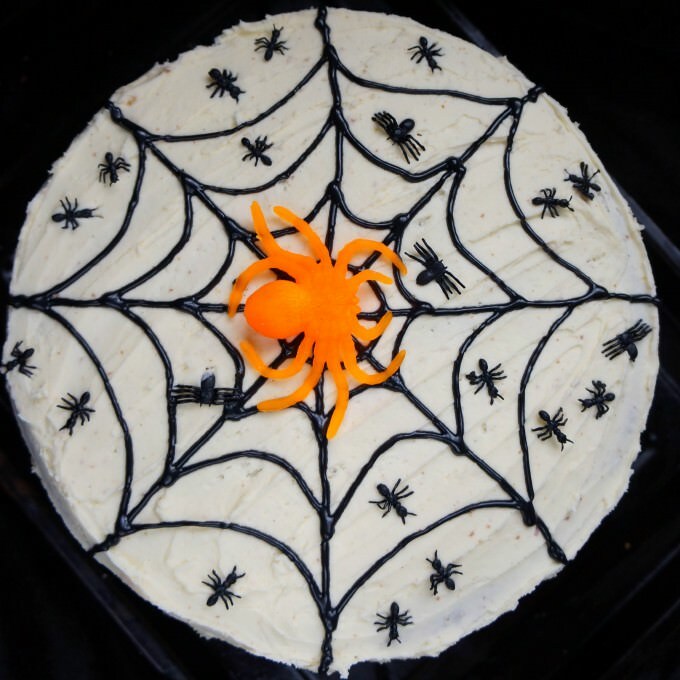 I have been admiring your Halloween cake too! 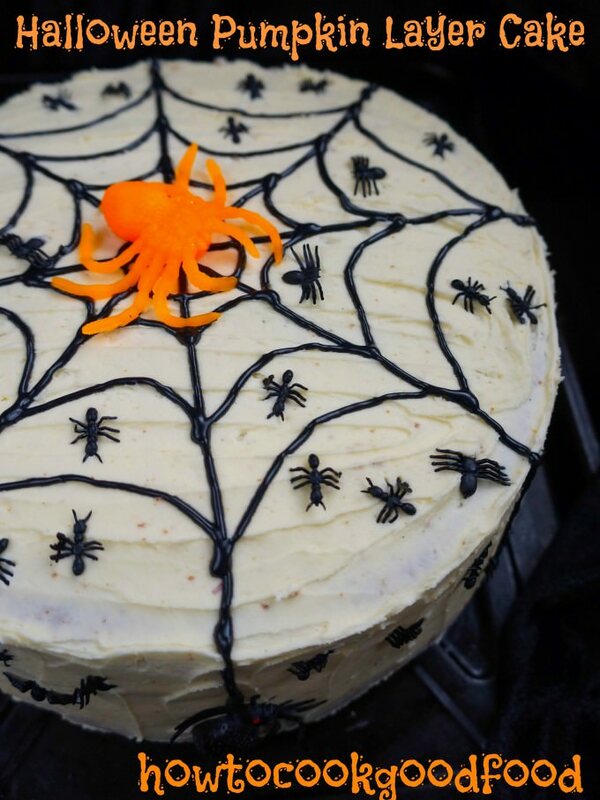 Superbly spidery, perfect for Halloween beasties! I love the orange spider! Looks like a yummy cake. I love the neon orange spider too, my favourite! Looks really wonderful, Laura. For anyone who is reading this, Tesco seems to have pumpkin puree year-round if your store has an American section. It will be the only healthy thing on those shelves! Oooh thanks for that piece of info Kellie, I will definitely keep that in mind as this is a cake I would make all year round. Minus the spiders! We need to become friends so that ou can make cakes like this for me. I would love to be able to share this with you Bintu! I’m feeling itchy as I look at this so you know it’s done it’s job of spooking me!!!! Love it! The joys of Poundland spiders! I have had a pumpkin cake on the menu all week this week at the cafe. Can’t seem to make it fast enough! Your version is a much spookier centrepiece altogether. Love the spiders in particular! Me too Urvashi and I think pumpkin cake is just as good as carrot, my other fave! what a gorgeously decorated cake Laura. I have a tin of puree sitting in my kitchen that is begging to be used in a sweet dish. I think I need to keep a stash of tinned pumpkin in my cupboard just for this cake, it’s a good and reliable sponge!